Pasquale Iannone is a film scholar and critic. He teaches at the University of Edinburgh and is a regular contributor to Sight & Sound and BBC Radio. 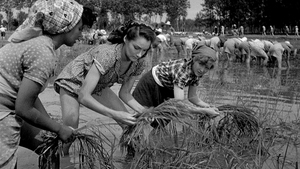 In Bitter Rice, Giuseppe De Santis focused his lens on the world of Italy’s female rice workers, for a story that’s part social commentary, part pulp melodrama—and introduced the world to a dazzling young actress named Silvana Mangano.